With the recent release of Microsoft's Photosynth to the Windows Phone Marketplace, there's really no excuse for anyone not to capture decent panoramic images. Photosynth joins a nice collection of in-house panorama apps and a decent third party app. But how do these panorama tools measure up against one another? We took our handy-dandy tripod out to see if one shined brighter than the other. There's really not a bad panorama app in the lot but a few lined up a little better than others. For our set-up we set up a tripod, leveled it out, and mounted the Windows Phone with an iStabilizer tripod mount. Due to limitations in some panorama apps, we shot three or four images on a horizontal plane to create the panorama. We gave each panorama tool a couple of tries, chose the best and did a little post-processing with each image for publication. 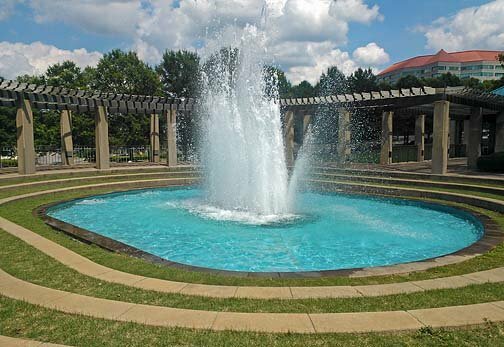 We chose a fountain (single image above) with bricked side walks and columns in the background. With all the vertical and horizontal lines, we figured this would be a nice test to see how well each panorama app stitched the images together. Lastly, we make mention of vertical panoramas in our comparison. Vertical panoramas may not be the traditional landscape styled photographs most are accustomed to. But if you're in an urban area and want to capture tall buildings, vertical may be the only option. Vertical composition is a key element of one of these apps so it's only fair that we see how the others compare in this respect. Samsung Photo Studio: Photo Studio is an exclusive app for the Samsung Windows Phones. It has a few editing and special effects tools but it also has a panorama tool. The panorama tool will let you take up to six pictures on either the vertical or horizontal plane (can't combine the movements). If you shoot less than six frames, just pan backwards and the app automatically goes into stitching mode. As far as features beyond creating panoramas, Samsung's Photo Studio has the ability to edit the panorama and share it via Facebook, Photobucket or Picasa. Editing covers the basics such as exposure, cropping, etc. Panoramas are saved to your Windows Phone Pictures Hub where it can be further edited or shared as any other picture could be. Autopanorama: Autopanorama (here's our review) is a third party app for building panoramas. While the other apps in this round-up calls for you to take the first image then the app takes the remaining shots automatically, Autopanorama relies on you to not only take each image but also align the frames up. You take one picture and an alignment window will appear to let you line up the next shot with the tail end of the picture you just took. The image pan/movement is from left to right. While there isn't a limit on the number of photos you can stitch, Autopanorama is restricted to either horizontal or vertical shots but it can be tricky. To shoot vertical panos you'll need to hold the Windows Phone vertically and shoot top to bottom. Additional features with Autopanorama includes a small group of settings to control the transparency level of the alignment window and flash settings. Once saved to your camera roll the image the panoramic image can be shared or edited as any other image in your Pictures Hub can. 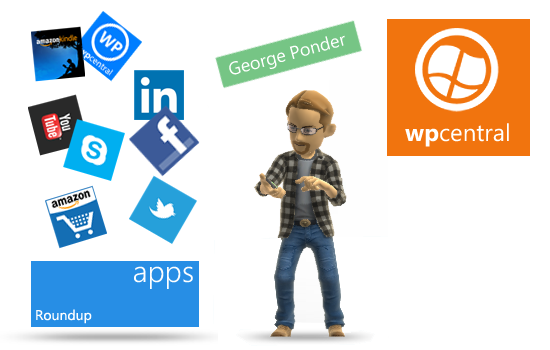 Autopanorama is a free app that can be found here at the Windows Phone Marketplace. HTC Panorama Tool: HTC is the only Windows Phone that has a built in panorama tool that is accessible from the main camera app. The panorama tool allows you to shoot three images on the horizontal plane and stitches them together. A horizontal line runs down the center of the screen to act as a guide and when you pan across one of the three points on this line, the camera automatically takes the photo. You can pan the camera left or right to build your panoramas. As with Autopanorama, you can shoot vertical panos by holding the HTC Windows Phone vertically. It's a little tricky but possible. Beyond capturing a panoramic image, the tool doesn't have any additional features. Once saved to your camera roll folder in the Pictures Hub, you can edit it or share it as you would any other picture. Nokia Creative Studio: As with Samsung, Nokia offers an exclusive photo editing app that includes a panorama tool. The Creative Studio's panorama tool allows you to stitch four images together to create the wide angle picture. You take the first image, pan to the right and the camera automatically takes the next three images. The Creative Studio pano tool can work vertically but as with Autopanorama, you need to shoot from top to bottom. Once you create the panorama in Creative Studio you can edit the image through the app's basic editing tools, share it via Facebook, Flickr or Twitter and then save the image to your Pictures Hub. 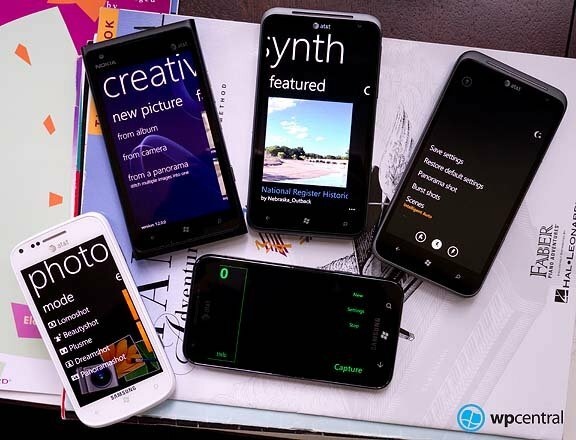 Photosynth: Photosynth could easily be the ultimate panorama tool for your Windows Phone. While the other apps are capable of producing fantastic panoramic images, Photosynth is the only option to take and stitch together a combination of horizontal and vertical images. You can create 360 degree, spherical images that can be rendered on your Windows Phone or through Photosynth's website for a realistic perspective. The process is rather simple. Tap the screen on the Capture Page of Photosynth to start the process and then slowly pan the camera in whatever direction you desire. A framing box guides you through the process as well as a horizontal guide line. When you've taken enough pictures, tap the "check" button and the stitching begins. Beyond creating the panoramas, you can share the images via Facebook, Twitter, Bing Maps, or email; upload the images to your Photosynth account and view them online at Photosynth.net; and crop the image then save it to the camera roll folder in your Pictures Hub. Hard to say. Each of these apps have the potential to create very nice panoramic images. Autopanorama is the most challenging because so much is dependent on the photographer. You manually align the images and manually capture them. The stitching process does a decent job of compensating for pilot error but some errors can't be overcome. This isn't to say you can't take a good panorama with Autopanorama but it takes a little more practice, patience, and a sturdy tripod. HTC's in-house panorama tool is simple but the most restricted in terms of how many frames you can stitch. The HTC app does a nice job of not only stitching the images with regards to alignment but also exposure. Still, it would be nice to see the three frame limit increase a little. Maybe have a settings option for 3, 4, or 5 images? The Nokia and Samsung in-house apps are very similar in design and function but Samsung lets you capture up to six images while Nokia's Creative Studio calls for you to capture four. Because of this, Samsung's Photo Studio has a little more flexibility. Quality of stitching is better with Nokia's Creative Studios though. I do like Samsung's interface a little better with the use of frames to outline each image as it's captured. Nokia has a directional arrow that slowly appears as you pan. Photosynth has the most flexibility with its ability to combine vertical and horizontal sequences. It's not a perfect panorama app with some stability issues and some stitching issues present. But more times than not, Photosynth hits the nail on the head. I would have liked to have seen more editing tools but what's in place helps clean the crop up when sharing and I can always use third party editors once the image is saved. Which is best may be a subjective measure but the HTC panorama tool and Nokia Creative Studios panorama tool seems to do the best stitching. But it's awfully hard to discount the flexibility and features of Photosynth. While some of these panoramic options are restricted to certain devices, all are free. Which means you can have as many as possible and not have to settle on just one panoramic tool. So what say our readers? What is your panorama tool of choice?